Despite the challenges of a more complex than usual design phase, producing the Voyager Collection has been a fabulous experience. Having first launched the series of rings in late 2016, cufflinks and pendants were always the next in line to create. With Voyager, it was about creating a contemporary collection that could represent the idea of charting a course; a metaphor for decision making and something that would, over time, become identifiably part of the Rhys James brand story. The inspiration behind the 12 sides that characterize every Voyager creation had two components. Originally, the 12 sided design for Voyager was inspired by the key points on a compass. Whether a ring on a finger or cufflink on a cuff, this beautiful and rather tactile visual device engages the wearer with the object, as they turn or twist it back and forth. The second element behind the inspiration was driven by the concept of "12 sides, 12 months of the year". Referencing the perpetual nature of the calendar was a lovely solution that enabled us to personalise a Voyager ring by marking a particular facet that might represent the month of an anniversary, birthday or other date of significance. For example we could add a diamond or sapphire on the 8th facet to celebrate an August anniversary. We recently customised a Voyager ring with two beautiful pink Argyle diamonds to represent the birth of the wearer's twin boys. Born in June, we marked the corresponding (6th) facet with these beautiful details. But where the Voyager cufflinks and pendants differ from the Voyager rings, is in the three unique linear "spokes" that sit within the 12 sided border. Each of these lines are dedicated to and represent our Brand philosophy of Beauty. Rarity. Legacy. 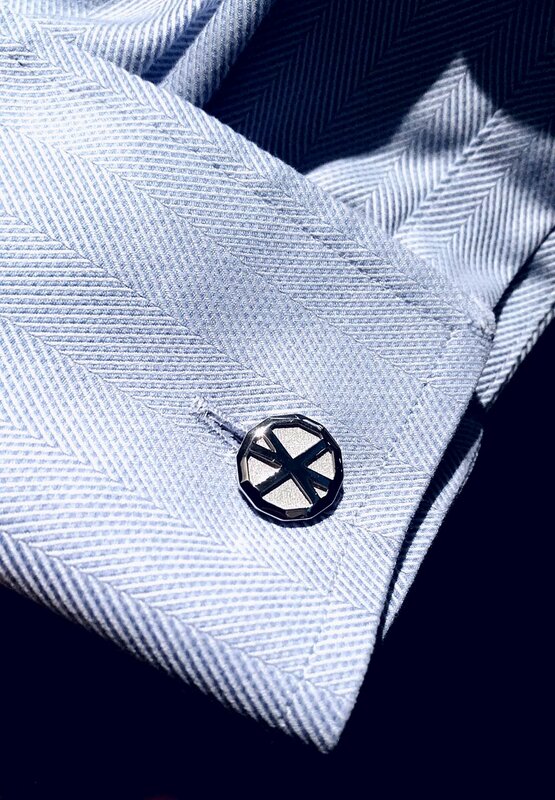 Voyager cufflinks will be available shortly in our store and can be pre-ordered now ready for Christmas gift giving. Available in sterling silver, 18ct rose gold, 18ct white gold, 18ct yellow gold or platinum. If you'd like to know more, please get in touch. We'd love to hear from you. Finer Details. Voyager cufflinks in 925 silver, inspired by the art of travel and understated detailing.